If you are seeking a chic hideaway with character in Morocco look no further. 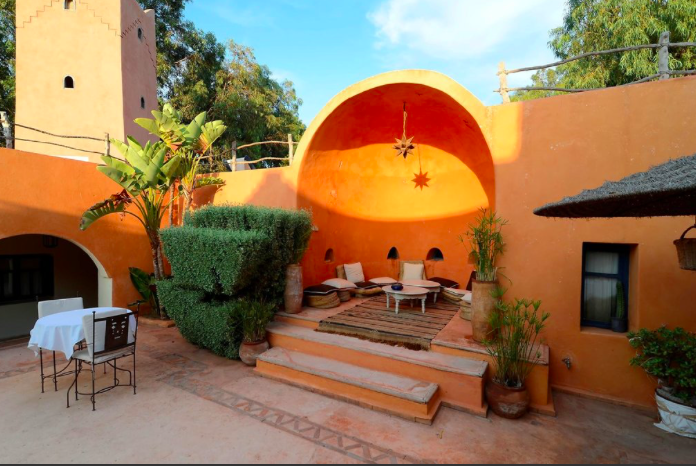 Riad Baoussala is an authentic and welcoming ochre-stained stone guesthouse, situated approximately 9 km from the enchanting town of Essaouira. Kaleidoscopic colours with minimalist design will have you acting like the paparazzi, snapping away, with every nook acting as the perfect setup for a photo-shoot. Aside from the vibrant personality the property embodies, it makes for a wonderful place to visit when in need of some downtime or as a base for exploring the region. The intimate courtyard remains at the hub, circling the rooms and creates a charming and relaxing atmosphere. Nature surrounds the Moroccan property, which has just seven cosy rooms and suites. Wake up to the sounds of birds singing and the smell of the eucalyptus trees and other types of flora outside. All rooms each have their own style and include decadent objects and finds, paintings strewn on walls, enclosed tadelak showers or sunken tadelak baths, low-seating and pretty textiles. A baby cot is also available at no extra cost. Breakfast bears no barrier, as guests can order this at any time and lunch can be eaten poolside. Chef Fati rustles up glorious meals with local produce which vary on a weekly basis but every Sunday rest assured, as a traditional couscous dish is always on the menu. Guests simply need to confirm in the day, if they would like dinner to be prepared during their stay. You'll find an abundance of spaces to enjoy, from the large swimming pool to the garden and of course the rooftop. Thus, making it easy for those with children to also unwind and play. Guests can also treat themselves to scrubs, massage treatments and more as there is a dedicated zone for wellness, where a traditional hammam, an outside bath and massage cabin is available.